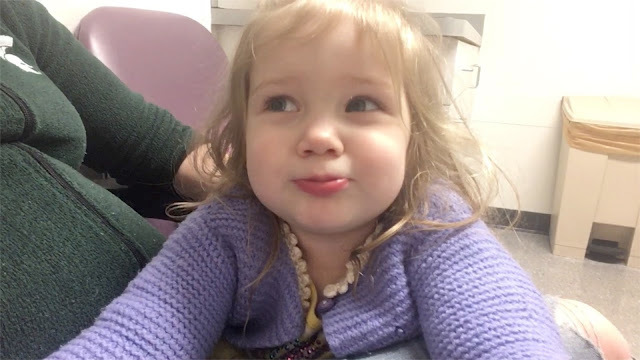 Yesterday was Tessie's very first gastroenterology appointment to try to figure out why she's having tummy troubles. And it was interesting to say the least. The resident who we say before we saw the doctor who had treated her back when she was a tiny baby in the PICU, went over her entire chart with me, and while going through it he said "so she has Segawa Syndrome?" "Um? I don't think so? I have never heard of that. What is it?" I replied. "I'm not really sure." He said. "I had to look it up before I came in here to talk to you, because I'd never heard of it either. Did she used to fall down randomly a lot?" "Oh that. Yeah. She would be fine, crawling or walking, and suddenly she'd just fall over and over again. 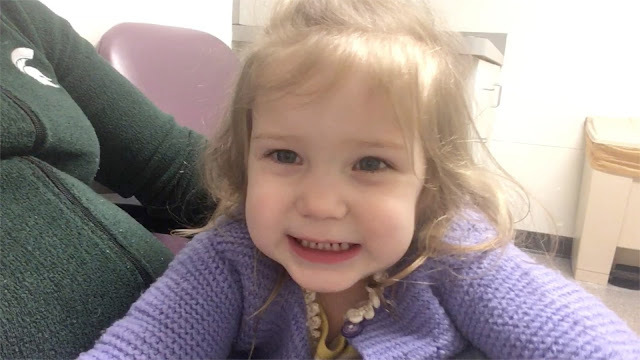 They thought they were seizures, but her EEGs are all normal." "But no one ever told you she has this diagnosis?" So he's thinking she doesn't have the diagnosis. I'm guessing that maybe a doctor at the hospital during one of her stays suspected it and put it down and never removed it. I'll be asking her primary care doctor and neurologist about it at her next appointments, which aren't too far off. But, back to gastro matters. They are leaning towards thinking this is an allergy issue. Which is good, I guess because a mild allergy is not anything more serious. But which is sad because she loves all things dairy and they are seriously suspecting dairy. And because when we tried soy, almond, cashew, rice, and coconut milk she also got really sick, he's having her drink pea milk. We're just hoping that doesn't make her sick too. And while I've been thinking about gastro appointments and sensory issues a lot lately, as Patrick heads into his first feeding therapy eval, which he desperately needs, I made a video about why I wish we hadn't done baby led weaning. I don't think that baby led weaning is necessarily a bad thing. I think it's totally fine for developmentally normal babies. But I think it can be a real problem for kids who have developmental delays and that's why I wanted to share our experience using it for our last three babies. Meanwhile I've been going through a parent training that I did with Maggie again with Tessie. And just like with Maggie, this fantastic training has been having really positive results. And another video of us using it to work on practicing sounds! And since my last post I have published two more chapters to my novel over on Wattpad! That is it for today because we need to rush off to OT and speech right now! Hope you are having a great Friday! I've read about this idea of letting the child lead. My daughter is 19 yo (20 in a couple of weeks) but even as an adult letting her lead by allowing her to ramble on and on about Pokemon really does bring her out and get her to engage so much better.